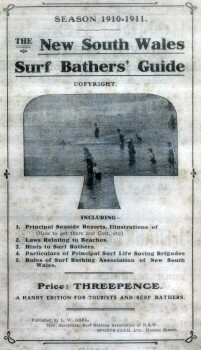 New South Wales Surf Bather's Guide, 1910. New South Wales Surf Bathing Association. : The New South Wales Surf Bather's Guide. Sports Club, Ltd., Hunter Street Sydney. prolific chroniclers of the Sydney surfing scene. Phil Harris:Surf-Bathing in NSW, 1907. MANLY AND DISTRICT It is safe to say, without fear of contradiction, that no suburb or township has felt the benefit of the surf-bathing boom to the effect that Manly and district has. Manly may be looked upon as the original home of the surf bather. Years ago, when the sport was followed by few men, and fewer women, bathing separately, it was practically unknown outside Manly Beach. However, time and commonsense have changed all that and to-day surf and mixed bathing, from being the pastime of the few, is recognised as one of the national sports of the Australian public. Manly owes its popularity to its unique position, its varied attractions and the series of safe surf bathing beaches with which it is endowed. Year by year its patrons increase, and the "Village" of a few years ago has disappeared and in its place is a town- a city- with a population rivalling that of the largest country towns of the State. ... tion provided by a Council in a chronic state of "hard-upness" has had of necessity, to be increased, and within the past few years a new and popular spot at North Steyne, as distinguished from Manly (South Steyne) has sprung into existence to cater for the requirements of the ever-growing North Manly. There are two clubs on the beach, the Manly Surf Club, and North Steyne Life Saving Club, both numbering several hundreds in membership and possesslng commodious club rooms on the beach for the use of the members. Both clubs yearly arrange carnivals, and attract large crowds from all parts of Sydneyand suburbs. The steamer trip,of severn miles from Cirular Quay to Manly costs 3d. return, and season tickets are issued at specially low rates. There is good hotel and boarding-house accommodqtion, and furnished cottages in abundance. A tram meets all boats and runs to Brookvale, three miles (adjacent to Curl Curl Beach); while coaches and motor 'buses leave at frequent intervals for all parts of the district as far as Pittwater (Newport and Bay View). A tram has just been opened between Manly and the Spit and the whole converted to electricity. 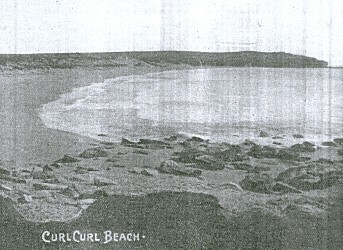 Curl Curl Beach, circa 1910. Not a dwelling or person insight. FRESHWATER. Freshwater is such another Stanwell Park. Beautiful flat hard golden beach, shelving slightly, and rarely, if ever affected by currents. It is just over the Queenscliff headland from Manly Beach; and its ladies' and gentlemen's sheds, and local Life Saving Club. 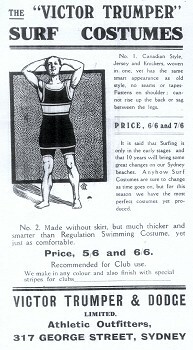 Advertisement for "Victor Trumper" Surf Costumes. Jersey and Knickers, woven in one, yet has the same smart appearance as old style, no seams or tapes: Fastens on shoulder; cannot rise up the back or sag between the legs. it is said that Surfing is only in the early stages and that 10 years will bring some great changes on our Sydney beaches. Anyhow Surf Costumes are sure to change as time goes on, but for this season we have the most perfect costumes yet produced. No.2. Made without skirt, but much thicker and smarter than Regulation Swimming Costume, yet just as comfortable. ... and only requires a little better access for it to take its fitting place in the suburbs of Sydney. A club-room is in course of erection. CURL CURL. Immediately beyond Freshwater lies Curl Curl Beach, extending for. about a mile. It affords splendid bathing, but is not considered quite as safe as Freshwater Beach. It is the headquarters of the Mona Vale Surf Club (sic), which has, with the assistance of the Shire Council, provided accommodation for both sexes. Large numbers of week-end campers are located here. Curl Curl is also reached by tram to Brookvale, and a walk from the terminus of about a mile. NARRABEEN. The beach at Narrabeen, 7 miles from Manly, is the largest in the vicinity of Sydney, and is also as safe as most beaches. Motor 'buses at present serve it from Manly, at 1/- each; but it is probably that in a very little while it will have a tram of its own, extended from houses, and several furnished cottages. Narrbeen Heads, and dressing sheds erected. The Narrabeen Lakes- a beautiful sheet of water- empty themselves into the sea at the Narrabeen Beach. MONA VALE. Mona Vale is about 9 miles from Manly, and is served by several coaches daily; fare 1/6 single. The local Surf Club is only a small one, but is doing good work. They have erected their own dressing-sheds, and contemplate hewing a bathing pool out of the rocks as an additional attraction. NEWPORT (PITTWATER) Newport Beach is the favorite surf beach of Pitt water district, and occupies a picturesque position between bold headlands. Newport lies snugly on the shores of Pittwater, and is served by coach from Manly (12 miles), fare 2/- each way. Good hotel and boarding-house accommodation is available. It would be difficult to find a spot offering such a number of charming views or such variety of entertainment. A short walk to the point where the road branches off to Barrenjoey will give visitors a most extensive view of Pittwater and the coast-line. From here one sees the road winding from Manly through the trees, and thinks of the time when it was used as a lookout station for the mails by the enterprising knights of the road, from which it obtained its name of "Bushrangers' Hill." The beach is within a few minutes walk of the hotel, while the wharf lies at the bottom of the grounds. Round trips are arranged by the Government Tourist Bureau from Sydney to Manly, Newport, and Hawkesbury River, or vice versa, every Tuesday and Saturday throughout the year; fare 8/6. Fishing is good, boating or sailing ideal, and during high tide the water maze is well worth exploration. Launches ply for hire regularly in the bay and connect with the coaches from or to Manly. Richmond River- Tuesdays. Thursdays & Saturdays. Clarence River- Tuesdays and Saturdays. Byron Bay- Tuesdays and Saturdays. Tweed River- Tuesdays and Saturdays. Macleay River- About every five days. Bellinger River- About every five days. Nambucca River- About every five days. Coff's Harbour- Tuesdays and Saturdays. The above are the regular, but extra steamers are despatched to any of the Rivers when necessity requires it. The steamers flying the Company's flag are well known to the public for their speed, safety, and comfort. The catering on the Company's steamers is unsurpassed, this being conceded by all who have travelled by the line. Head Office and Wharf 3 Sussex Street, Sydney. Wharf ... ... ... Foot Druitt Street, Sydney. Passenger Office ... ... 261 George Street, Sydney. ... is the Elleriborough Falls, situated about 26 miles in a north-westerly directlon from Wingham, which may be reached by a good road extending to within 6 miles of the falls, and then by bridle track. The height is given as 510 feet; above the falls is a long deep reach of the river- overhung with luxuriant vegetation- which pours its waters into a valley thickly overgrown with sub-tropical plants, ferns, palms, and flame trees. The sight is a magnificent one, and will well repay the journey entailed. Coach fares to Wingham, 1/6; Port Macquarie, 20/-. At the heads where the river flows through the breakwater into the ocean is a fine beach, where the local resIdents of the dIstnct indulge m the healthful pastime. There is good hotel accommodation at the Heads. PORT MACQUARIE. There are few spots in the State which afford so many historical associations as Port Macquarie, or which are more full of surviving evidences of them. The town has an old-world air about it, with frequent specimens of old and decrepit buildings scattered about, mostly convict built. The Hastings joins the sea in close proximIty to the township, the bar being a perfectly safe one. There is a fine surf-bathing beach at Port Macquarie, and the fishing off the beach, rocks, and in the river is of the best. The most picturesque route to the "Port" is via Port Stephens and the Myall Lakes, connecting by coach at Tuncurry for Taree and Port Macquarie, the fares being 46/- single and 77/- return from Newcastle. There is good hotel accommodation. BELLINGER HEADS. Bellinger Heads, or Arunga, is a quiet seaside spot, with good hotel accommodation. The surf-bathing beach is excellent; while fish. and oysters abound. The principal town-s on the river are Bellingen, on the road to the Dorrigo, and Raleigh. There is a regular line of steamers by the N.C.S.N. Co., the fares being 3/- single, 50/- return. The favorite route. however, is to Coff's Harbor by ocean steamer direct, and coach to Bellingen, meeting all steamers. YAMBA (Clarence River Heads). Yamba (Clarence River Heads) .- This pretty little village, situated at the entrance to Clarence River, is one of the finest seaside resorts to be found on the coast. It is reached by North Coast steamer from Sydney, landing passengers at Iluka, a fishing station, being the first stop for steamers on the Clarence River. The fishing here is perhaps, better than anywhere on the coast; large shipments are sent to Sydney twice a week. Established here is the Yamba Surf Club, which has done much to popularise this resort. There is an hotel situated on the banks of the river; with a fine lake for swimming. There is also good boarding-house accommodation handy to the Yamba ocean beach. It is an ideal resort for a holiday. New South Wales Surf Bathing Association, Manly, North Steyne, Bondi Baths, Cronulla and all leading Surf Clubs. PUBLIC NOTICE. DON'T bathe if subject to giddiness or faintness, or shortly after a heavy meal. DON'T bathe in secluded spots by oneself, or near rocks, or where quicksands exist. DON'T bathe whete the waves are not. breaking, or where the water is smoother or darker than elsewhere. DON'T bathe where "Danger" Signals are placed. DON'T enter the water when feeling cold, or remain in the water when the hands or feet become numbed. Cramp resulting there-from will thus be avoided. DON'T waste strength by struggling against the current or "under- tow," if carried out, but swim across or around It. The Bather will then probably be swept by the waves into shallow water. DON'T get flurried, but, if help is required, raise one arm (only) over the head as a signal of distress. Then turn on the back and float, facing tihe incoming waves. DON'T struggle with the person attempting the rescure. If the sea be rough, keep close to shore, especially if inexperienced in surf-bathing. DON'T remain in wet costume after leaving the water. DON'T be foolhardy, but keep together, thus avoiding possible fatalities. In case of accident, remain cool and collected, ana avoid hampering in any way the work of the Life-savers. Particulars of the Principal Clubs. Bondi Surf Bathers' Life Saving Club, L. Harris, Hon. Secretary, York-road, Waverley. Bondi Baths Life Saving Club, A. L. Cohen, Hon. Sec., Woodstock-street, Waverley. Bondi Surf and Social Club, H. Drew, Hon. Sec., 27 Newland-street Waverley. Coogee Surf Club, H. Johnson, Hon. Sec., Brook-street, Coogee. Coogee Surf and Social Club, S .L. Snell, Hon. Sec., 407 Liverpool-street, Darlinghurst. Cronulla Surf Club, W. R. Louden, 28 Elizabeth-street, Redfern. Freshwater Surf Club, W. R. Waddington; Hon. Sec., Post Office, Freshwater. Little Coogee Life Saving Club, H. W. S. Ford, Hon. Sec., 20 Watkins- street, Bondi. Manly Surf Club, A. A. Watson, Hon. Sec., Box 2, Petersham P. Office. Maroubra Surf Club, P. lnder, Hon. Sec., c/o Box 312, G.P.O. North Steyne Life Saving Club, E. M. Shemwell, Hon. Sec., Pacific-street, Manly. Newcastle Surf Club, N. Morris, Hon. Sec., Post Office, Newcastle. Port Kembla Surf Club, R. P. Williams, Hon. Sec., Port Kembla. Royal Life Saving Society, Geo. H. Williams, Secretary, N.S.W. Head Centre, Foy's Chambers, corner George and Bond streets, Sydney. Stockton Surf Club, H. Leslie, Hon. Sec.. Stockton. Other Clubs are :- Newport, Mona Vale, Bronte, Wollongong, and Stanwell Park. Full particulars may be obtained on application to above secretaries. L. C. J. Ormsby, Esq. Cecil Healy, Esq E. W. Quirk, Esq. L. W. ABEL., Sports Club, Ltd., Hunter-street. F. A. THORPE. C. D. PATERSON. AN ACKNOWLEDGMENT. The Publisher desires to thank the Government Tourist Bureau and Mr. C. D. Paterson, for Blocks lent and information supplied and, also the business people who so liberally and kindly advertised In this Guide and hope readers will take notice of same. NOTES. This, the First publication of its kind on Surf Bathing and Surf Resorts, will be published Annually. Owing to the Season being well advanced this publication was restricted to 2,000 Copies; but the 1911-1912 Edition will be put in hand during Winter Months, will be enlarged in size, and some 8,000 Copies will be available early in the Season. Bondi, Feb. 25th., Newcastle, March 11, 1911, Coogee March 18, Manly, March 25, Cronulla, April 17. Surf Bathing Association of N. S. Wales. 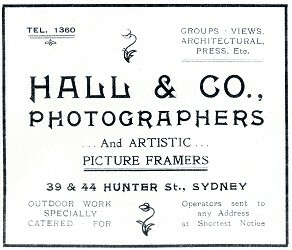 Co. Sports Club, Ltd., Hunter St., Sydney. The New South Wales Surf Bather's Guide. Surf Bathing Association of N.S.W. Geoff Cater (2008) : NSW Surf Bathing Association : Surf Bathing Guide, 1910.